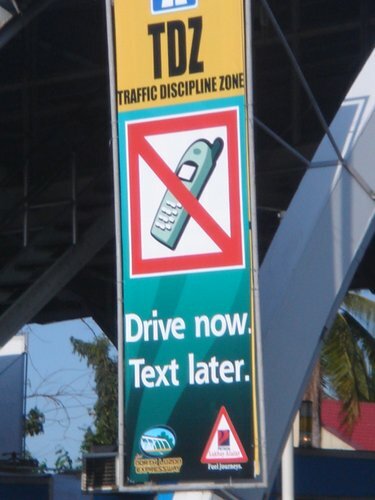 Laws, law makers, and texting | Be Nice. Kruger’s bill remains stalled in the senate’s Transportation Committee. One other state – Illinois – is considering a similar measure. I know, I know… what is this blog for if not to contemplate our behaviors and how they harm and help others? But this blog is also all about personal responsibility and I believe in the importance of our personal freedoms as well. And to me, this law seems over-the top. I’m not denying that this activity poses a danger, but so does eating while driving, yelling at your kids in the back seat, changing the radio station while driving, and window gazing while walking. But, I grow more and more concerned that our government continues to police behaviors, rather than trusting in our maturity to manage things ourselves. If a kid eggs my house, I don’t file charges. I vent angrily to my spouse, and then calmly talk to her/his parents (if it were my kid, I’d want the same treatment). Similarly, if someone is walking without paying attention and are about to collide with me, I walk around them. Perhaps the issue is that many city dwellers do not yield to others on the sidewalk, and so collisions are more likely when people play the game of sidewalk “chicken.” Then of course a pedestrian might cross the street without checking cross-traffic. But hopefully the drivers are watching out for possible collisions and defensively avoiding them. Following 2 major principles of civility–reaping what you sow, and avoiding troubling situations by being aware–it is pretty acceptable to allow this issue to exist without legislation. There are the unfortunate incidents where these two ideas aren’t enough, but I think those instances don’t warrant a law. That politicians spend time policing our behaviors through laws, and not enough time policing themselves or governmental functionality, worries me. Is texting our biggest problem? No. Not even close. And can’t these texting maniacs police themselves? Yes. I’m all about laws that provide information: like listing calorie counts at restaurants. Because I can still eat dessert and not get a fine. And I am supportive of laws mandating regulations for driving (big objects = big damages). If they’re going to tax tobacco and sugary foods, please don’t use the money to cover up decades of bad spending and legislation. Use it to educate kids about proper nutrition, or serve healthier meals in schools. And if the politicians want to legislate behavior, why not impose restrictions on campaign finance? How about establishing a dialogue by promoting responsible use through billboards and ads? I must be honest, I see both sides. The line is not finely drawn. 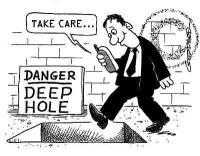 I think using cell phones while driving is bad, even though using it while walking could be just as hazardous to the text-er and the person colliding with him/her. So this one is certainly in the gray area. And State Senator Kruger’s law is not entirely invasive to every New Yorker. But what concerns me is the numerous number of laws being enacted that restrict us in tiny ways, that, if allowed to accumulate, will dictate how we live every aspect of our lives. If these types of laws become the norm, it leads me to believe that politicians will govern anything that will bring in revenue and play on our sense of fear and loss of control. If these laws are a reflection of our time, it leads me to believe that we cannot trust ourselves to act responsibly or maturely. And I am not willing to accept this. Let’s all be model citizens and be held accountable for our actions by their repercussions. Not by a fine. Last I remember, I learned right and wrong by making mistakes. My folks never taxed or fined me for making mistakes, eating ice cream, or dropping a swear word. I learned morals and propriety based on the perception of my character and the effects of my errors. If I walk and text, and collide with a pole, I probably deserved it (by the way–I don’t actually have text messaging capability on my phone. I disabled it.). If I get high blood pressure and diabetes from being overweight and doing nothing to avoid it, I deserved that too. Let that be the punishment. Don’t micromanage my life. The world is an uncivil place. The sidewalk is too. And I am okay with it, if it means I don’t have a police officer wasting his/her time fining me over my cell phone usage while walking mid-stride in Manhattan. I would rather be frustrated by the crowds of distracted, texting pedestrians than give up another basic civil liberty. I would rather believe in what this blog is about: self-governing is a natural and necessary part of society, and by talking about these issues with our peers we slowly and surely improve society. This entry was posted in In Traffic, Perspectives on Be Nice. and tagged cell phone ban, Driving, dumb laws, leglislation, texting, texting while driving, Texting while walking by Jen. Bookmark the permalink.